Caroline Issa attends the ESCADA SS19 show at the Park Avenue Armory on September 9, 2018 in New York City. Caroline Issa stayed comfy in flat rainbow-hued sandals. 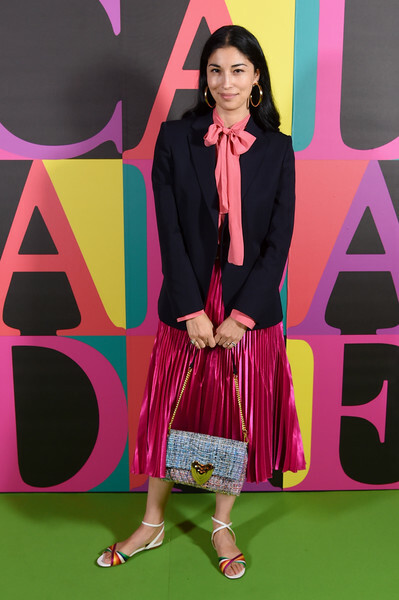 Caroline Issa layered a navy blazer over a pink pussybow blouse for the Escada Spring 2019 show. Caroline Issa completed her business-chic outfit with a pleated fuchsia skirt. For her arm candy, Carolina Issa chose a stylish tweed chain-strap bag by Escada.